The BioMod team combines researchers with complementary expertise to study the structure-fonction relationships of biomolecules. On one hand, biostructure tools are used (NMR, X-Ray Diffraction, Homology Modelling, Molecular Dynamics) to determine the three-dimensional structure of enzymes and analyse their catalytic properties. On the other hand, original methods from multipolar charge density and ultra-high resolution crystallography are being developed in order to obtain accurate electrostatic properties of biomolecules. 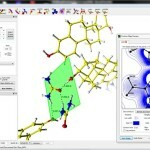 The development of these methods is done on the basis of MoProSuite program allowing the charge density refinement and MoProViewer which allows the visualisation of precise molecular properties and interactions. In close collaboration with biologists, biochemists and chemists, the team studies family of enzymes and small organic molecules with potential applications for health and in the field of agronomy. Fungi have a strong effect on plant health. On one hand, symbionts (such as mycorrhizae) can amplify yield of plant feedstock, on the other hand pathogens can have dramatic negative consequences on crops. The recent release of several fungi genome sequences allows understanding of the mechanisms of their interaction with plants and identifying the enzymes involved, for example, in the wood degradation process (Eastwood et al. 2011). Our analysis is focused on glutathione transferases (GSTs) which constitute a complex and widespread superfamily classified as enzymes of secondary metabolism. Recent studies revealed that glutaredoxins (Grxs) constitute a multi-faceted protein family, involved not only in oxidative stress response but also in other essential functions such as iron-sulphur assembly and haem biosynthesis. 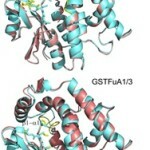 These discoveries also led to propose a new classification extended to six classes (Couturier et al., Cell Mol Life Sci. 2009, 66, 2539-57). 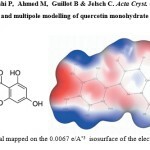 An extensive survey of Cambridge Structural Database is carried out to study the directionality and stereochemistry of hydrogen bonds with an oxygen acceptor including carbonyl, alcohols, phenols, ethers and esters groups. The results obtained through this survey are correlated with the charge density of these different chemical groups. The electron density of these different oxygen atoms types show striking dissimilarities in the electron lone pairs configuration. The refinement program MoPro (Molecular Properties) is dedicated to the charge-density refinement at (sub)atomic resolution of structures ranging from small molecules to biological macromolecules. MoPro uses the multipolar pseudo-atom model for the electron-density refinement. Alternative methods are also proposed, such as modelling bonding and lone-pair electron density by virtual spherical atoms.